It’s that time of year again, when the winter finally retreats and the sun, plants and hummingbirds return! 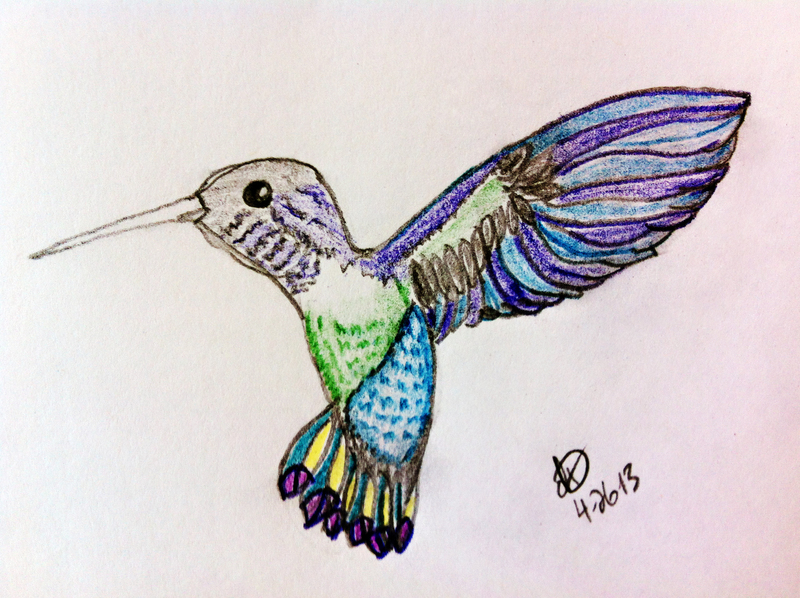 Here in Albuquerque, the most plentiful hummingbird we have is the Black Chinned Hummingbird which happens to look almost nothing like the techno-colored drawing I made. Female Black Chinned Hummingbirds are brown and the males are green with a black head. Down in the Bosque, one might occasionally see a Rufus but out here on the west side, our selections are pretty limited. No matter, I don’t care, I love them all and am always thrilled to see them return towards the middle of April! Upon hearing the buzz of little wings, the first order of business is to retrieve the feeders from the box in the garage and soak them in the sink. 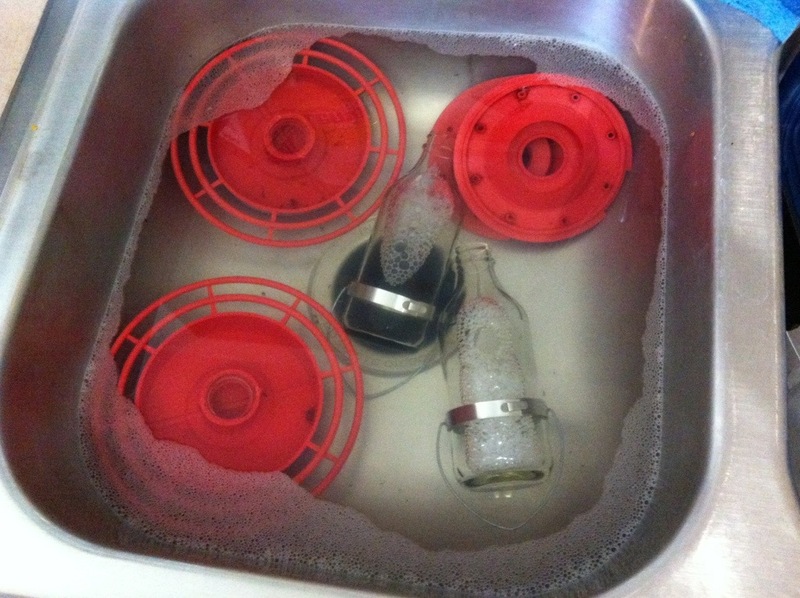 After this, they get scrubbed down with a toothbrush, not my toothbrush, and the glass bottles are whisked out with a wire contraption that is made specifically for that purpose. It is very important that the feeders be emptied and thoroughly cleaned at least once a week during the summer and fall. Regardless if they are empty or not, the food goes rancid in a relatively short amount of time and especially so if the feeders are hanging in the sun. In addition, insects have a knack of finding their way inside but are not too slick when it comes to getting back out so, you know, they just float around and rot. Anyway, clean the feeders thoroughly and often. 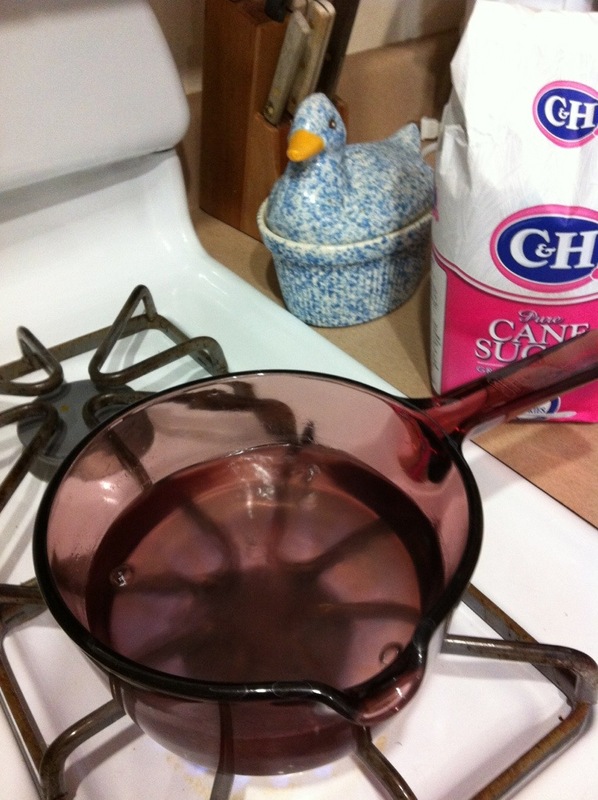 Boil the water, stir in the sugar, briefly return to a boil then remove from heat and allow to cool. If you like to make a lot at once, store the leftovers in a glass container in the refrigerator. Special Note: When I say “sugar”, I mean regular ole’ white G&H table sugar. It is very important that you only use sugar and nothing else. You are not helping the birds by adding honey, brown sugar, stevia or any type of artificial sweetener. If they wanted fake diet food, they could call Jenny Craig. But seriously, any of these other ingredients could result in sick or dead hummers so please, white sugar only. Another thing to keep in mind is that it is absolutely not necessary to add any kind of coloring to the mixture. The feeder itself is red, that is plenty of color to attract the birds. Once the food has cooled, fill feeders and put them out! Feeder placement is somewhat important. Hummingbirds are nervous little creatures and they like to be able to keep an eye out for predators at all times. Therefore, it is best to hang the feeders in an open space or fairly high up in a tree. To receive regular updates from DeAnna Dimmitt Mind Body Fitness, click the photo below and fill out the form! 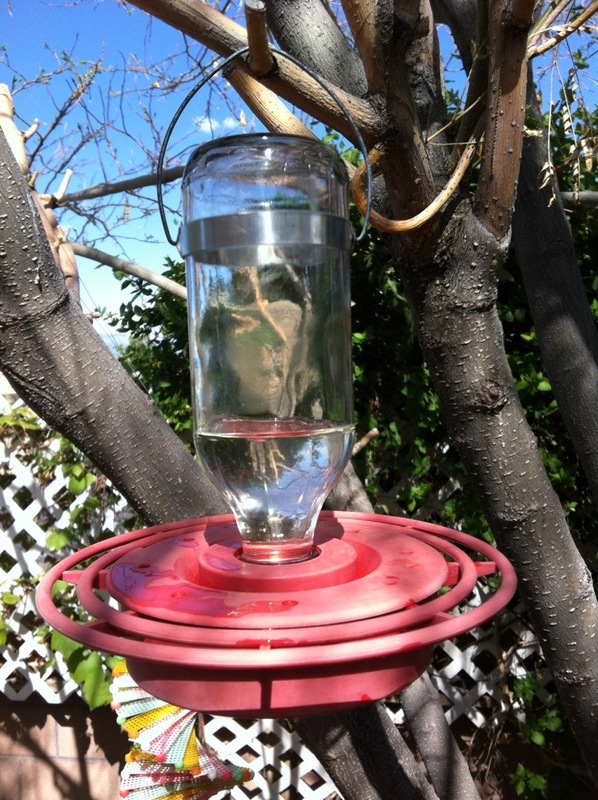 Categories: Gardening, Hummingbirds | Tags: albuquerque hummingbirds, black chinned hummingbirds, hummingbird feeders, hummingbird food, Hummingbirds, new mexico hummingbirds | Permalink.